Onekey Recovery for Windows free download. AOMEI OneKey Recovery is a kind of software designed for recovering system data. There are two buttons on the interface – the one is for system backup, and the other one is for system recovery. As the alternative to Lenovo one key recovery, it can be installed and used in any brand computers and PCs shipped with Windows system. Moreover, this FREE program can easily help you to create a factory recovery partition, make system backup and restore in case of your system crashes, and you can use it to restore your computer to its factory default or a previously backed up state by pressing “F11” (default) or “A” key during system startup. AOMEI OneKey Recovery not only recovers your Operating System but also all your applications, drivers and all personal data to the initial state when the AOMEI OneKey Recovery image was made. Like Lenovo one key recovery, AOMEI OneKey Recovery is a kind of insurance policy for your computer, but it supports backing up all types of laptops and computers, not just Lenovo laptops. The newest version cannot only provide encryption and compression, but also support to customize interface text, images and other aspects of UI. There are five editions of AOMEI OneKey Recovery: Free, Professional, Premium, Technician and Technician customization. 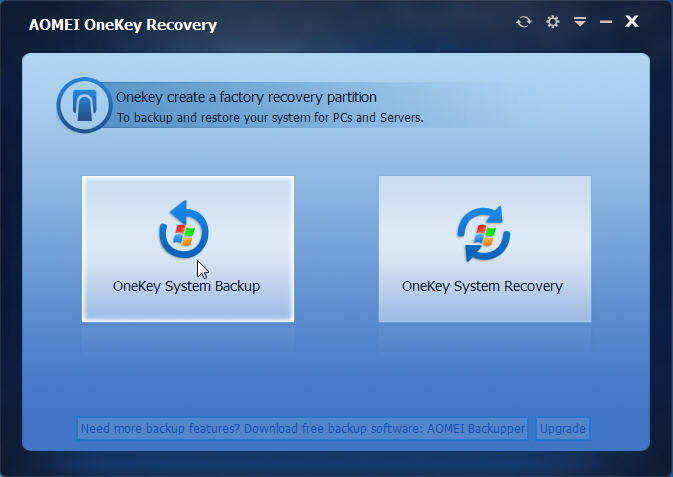 AOMEI OneKey Recovery Free is freeware designed to backup and restore your operating system. If you want to backup all your important data, backup files, partition, disk and so on, you can use AOMEI Backupper Standard – the simplest free PC backup software. System Backup: Select an existing partition to allocate a required amount of free space for creating a recovery partition, where a system backup image is saved. For preventing backup images from being damaged, the recovery partition will be hidden by default. System Recovery: Restore your computer to its factory settings or a previously backed up state. It is the best way to return things to normal when a disaster happens. Support restoring system to original location or other location. Emergency Recovery key: You can press “A”/“F11” to restore system image quickly after starting up. Supported Operating Systems: Windows 10/8.1/8/7/XP/Vista. Supported Storage Devices: Local disks, External hard disks, Solid state drives, USB flash drives, etc. Supported Disk Types: MBR disk, GPT disk and UEFI Boot.